With a variety of dal preparations dominating the Indian kitchen, dal makes a quintessential part of our meal. Each region of India has its own singular dal preparation, the list is endless. Not being an exception, dal is integral to our daily menu too. My hubby slurps dal like a soup when it is thin in consistency. The lentil preparations, thicker in consistency, are relished with roti or paratha by the side. To put it in one word, our food remains incomplete without a bowl of dal on our platter and I am yet to find one who doesn't like lentils. My love for lentil gives me an impetus to look out for new lentil recipes. Until I started exploring the culinary world, I didn't have idea, an iota, about the diversity of lentil preparations, the broad range of which only heightening my amazement. 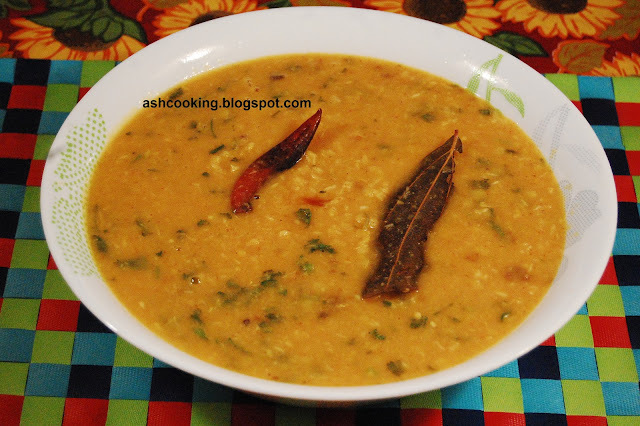 The recipe of the following dal I have come across recently in a culinary show but due to the unavailability of fresh lemon grass in market around this time of the season, I used lemon grass herb blend that lent a beautiful aroma to the dish. 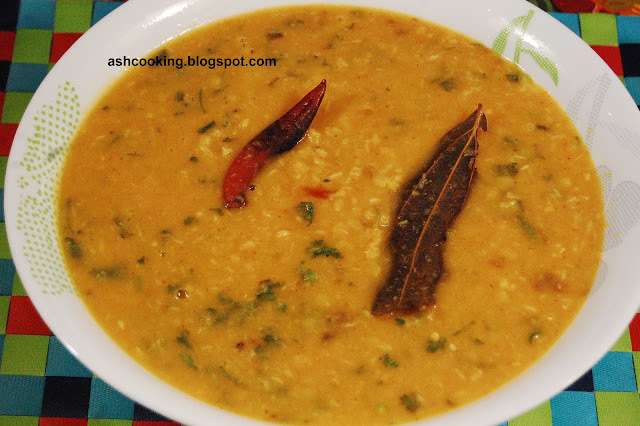 This dal, usually thick in consistency teams up well with paratha or bread. However, giving way to your preference, you may dilute the consistency. Note: lemon grass herb blend might not be easily available everywhere. So here is what you can do in case of its unavailability, boil a few stalks of lemon grass and mix the water into the dal. It will add a wonderful scent. 1) In a pressure cooker, pressure cook toor dal covered in 2-3 glasses of water mixed with turmeric powder for one whistle on high flame. Turn off the heat and bring it down to room temperature before taking the lid off. 2) Heat oil in a wok and when turns hot, add ginger and shallow fry till brown in color. Next toss in the ingredients for sauté and allow them to sputter. 3) Add coriander powder, dry red chilli powder and add 1/2 cup of water. Sauté the spices for 2 minutes. 4) Pour in the cooked lentil; add salt, coconut, green chillies, lemon grass herb blend or lemon grass boiled water. Add sugar and roasted cumin powder. Add water in small measure and simmer for couple of minutes. 5) Add lemon juice and garnish with coriander leaves.